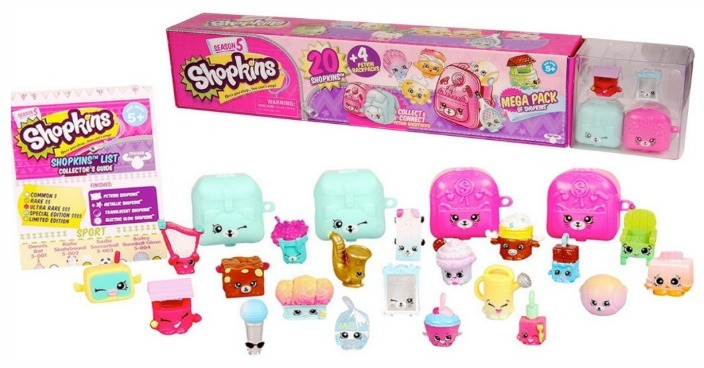 Shopkins Mega Pack Just $10! Down From $15! You are here: Home / Great Deals / Shopkins Mega Pack Just $10! Down From $15! Right now you can get this Shopkins Mega Pack for just $10 (Reg. $15) at Walmart! Season 5 Shopkins are here, with Musical Miniatures, Sporty Allsorts, Tiny Toys and more! There are also cute little Shopkins charms for you to collect and wear on your arms! Don’t forget to collect and connect the Petkins Backpacks.